Customized coasters may just be the perfect gift for every adult since everyone can use them. 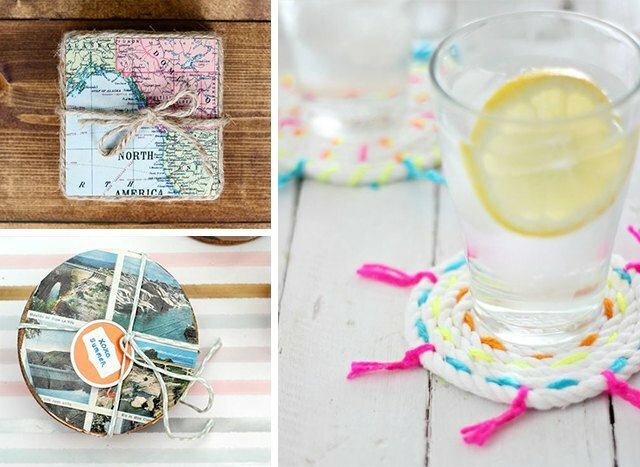 Paint your own designs on plain cork coasters, or create the coasters from scratch with cording, scrap fabric or even old travel postcards. 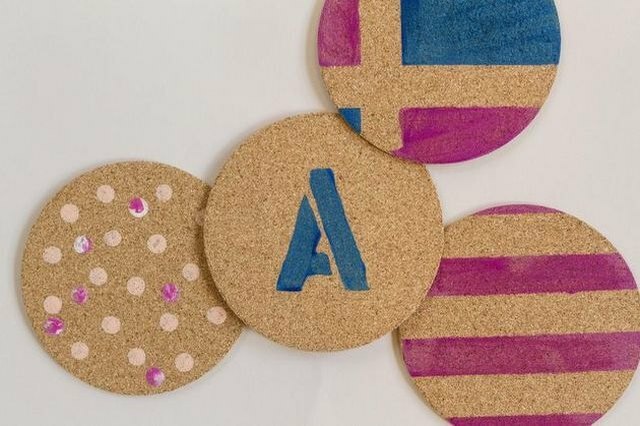 With just a little paint and a few plain cork coasters, you have completely customizable decor. Use painter's tape and spray paint to create stripes and geometric designs, or stencil a design on with your favorite craft paints. Make your own simple stamped designs using household objects, such as a pencil-eraser polka dots. A coil of twisted cording creates a simple yet effective coaster, perfect for protecting the patio table from a glass of iced tea. Add a few dabs of fabric glue as you coil the cord, then weave bits of yarn between the coils for a colorful, decorative touch. Use yarn that matches your patio furniture accent colors, or pick a friend's favorite color to offer the coasters as a gift. 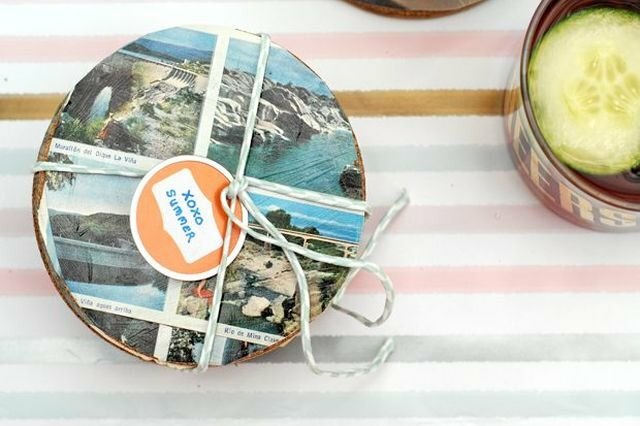 Create keepsakes from your favorite used or unused postcards by decoupaging them onto cork discs or plain cork coasters. Laser prints of travel photos will work just as well. Add one or more coats of decoupage medium to the top of each finished coaster to make it water resistant. Turn your toddler's or child's artwork into a set of patchwork coasters, perfect for a gift for the grandparents or other close relatives. 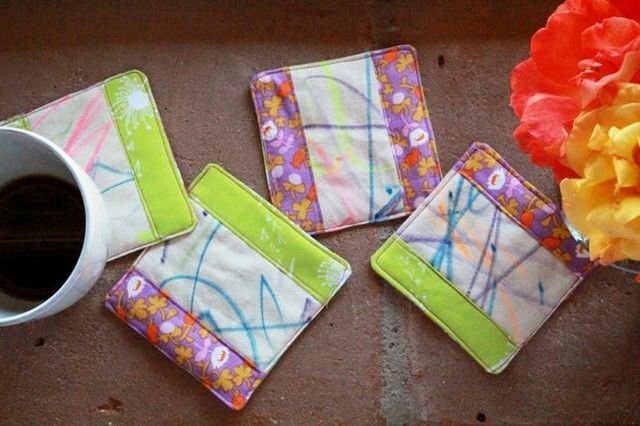 Encourage the kiddos to draw on muslin with fabric markers, then pair their masterpieces with colorful fabric scraps, sewing the materials together into patchwork-style square coasters. These coasters offer a useful alternative to hanging the kids' artwork on the fridge. Plain ceramic tile and craft paints pair up for simple ceramic coasters that take minutes to create. Cut and glue felt pads to each corner on the bottom to ensure the coasters don't scratch the furniture. Dab one or more colors of acrylic paint onto the top of each coaster to create a planned or random design. Once the paint dries, add a coat of a spray sealer to help protect your creation. These creations are fun, functional and facile. Summery weather, cold drinks and coastlines go together perfectly, whether you spend your time on the beach or on a boat. 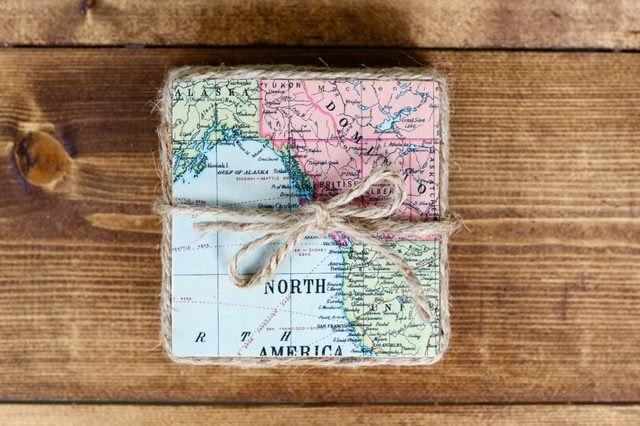 Craft a batch of these nautical-themed coasters using vintage maps that show waterways and shorelines to stick with the theme. Decoupage the maps onto thin squares of wood, then seal them with polyurethane. Glue a natural twine around the edges, then use more twine to tie the set together. 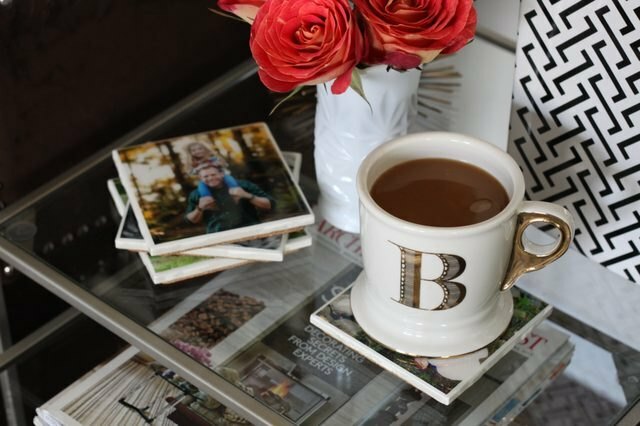 Turn your favorite laser-printed photographs into custom coasters by decoupaging them onto plain ceramic tiles. Once the decoupage dries, seal your creations permanently with a two-part polymer resin. Glue cork to the bottom of each coaster for a finished look that also protects the furniture.